A sudden revelation comes to Vala in a dream - a combination of the addresses for Castiana, Sahal, and Vagon Brei will lead to a new planet on which the Sangreal will be found. Once on the medieval world, SG-1 learns that Ba'al had arrived three days before, and the villagers warn of enchanted forests, cursed by Morgan Le Fay herself. Osric, the village librarian, shares the Parchment of Virtues, which urges prudence, wisdom, charity, kindness, and faith on the perilous quest. When soldiers of the Ori invade the village, Osric offers his assistance to SG-1 and begs to accompany them as they make their escape and begin their quest for Merlin's weapon, the Sangreal. On their journey, SG-1 encounters Morgan's tests. First is a time distortion maze for which prudence is required to navigate the circuitous path through temporal fluctuations. Next is a force field in which Ba'al has already been trapped. Through charity, the team deactivates the field to free themselves, and Ba'al joins the quest as an unlikely ally. Finally arriving at the cave, the team confronts Osric, suspicious of his ties to the Ori. His deception is exposed when Osric's true identity is revealed - it is Adria. Knowing Morgan's safeguards would neutralize her powers, Adria had sent the dream to Vala that would bring SG-1 to her and allow her to claim the Sangreal. The enchanted cave holds still more challenges to determine truth of spirit. Kindness to a crying child opens a hidden passage. The cave begins to tremble, but wisdom to solve a series of riddles prevents the cave from collapsing. At last a wall of fire blocks their way until Daniel accepts the final virtue, faith, and walks through the flames unharmed. Ahead lies a vast cavern with a narrow causeway above a bottomless abyss, leading to a pedestal on which rests the glowing red stone that is the Sangreal. However, it is a hologram, and as Daniel tries to grasp it, the final challenge rises from the depths of the cavern - an enormous fire-breathing dragon. The Sangreal shall belong to he who speaks the guardian's name, but as SG-1 is pursued by the fire-breathing dragon, it is "Ganos Lal," Morgan's name in Ancient, that causes her guardian to vanish. However, the Sangreal in the cavern remains a hologram, and this time the team's attempt to claim it activates an Ancient obelisk. Instantly, they are transported to a cave on another planet, a lifeless desert world, leaving Adria behind. Within the cave is a stasis chamber, concealing Morgan's true treasure. Unable to protect the Sangreal from the Others, she had preserved in stasis for over 1000 years the one man capable of building another - Merlin. Morgan's elaborate security system activates the stargate at regular intervals as the obelisk sends Merlin's cave through a circuit of planets outside the gate system. As the team is transported to a frozen world and a temperate rain forest, Adria and her soldiers are in close pursuit, and Carter and Ba'al collaborate to reprogram the dialing system to enable them to dial home. Meanwhile, Merlin has been revived and he agrees to build his weapon once again, using an Ancient repository to construct it virtually. However, his weakened body is failing him. With one final task before him, he wishes Daniel luck, then steps to the repository, and collapses. Merlin is dead. Daniel recognizes Merlin's plan. Knowing death was near, Merlin had left the answers in the repository before he died, and as Daniel interfaces with the device, he acquires Merlin's abilities and the knowledge to complete the weapon. The work is draining, however, and Daniel grows weaker as each phase is completed. Carter and Ba'al succeed in reprogramming the DHD, but suddenly Adria and her army arrive on the planet. Calling on the powers of nature, Daniel strikes down Adria's soldiers and allows SG-1 to escape through the gate, but his powers are no match for Adria, who triumphantly returns to her ship with the device and with Daniel as her prisoner. This episode aired in two parts. The locations of Castiana, Sahal, Vagon Brei, and Cameot combine to form a perfect tetrahedron. Planetary designations made up of symbols from all three addresses for Castiana, Sahal, and Vagon Brei, returned only one permutation in the SGC database - the address for the location of the Sangreal: 30-19-34-9-33-18. Morgan Le Fay put safeguards in place to ensure the Sangreal could only be secured by "those possessing truth of spirit." The Parchment of Virtues, written in Ancient, was left by Morgan as a guide for knights of noble spirit: "Only those of virtue true may win the prize concealed. Beyond the reach of the flawed and tainted, the Sangreal shall instead belong to he who speaks the guardian's name." "Prudence, wisdom, charity, kindness, and faith. Let these be your guide on this perilous quest." SG-1 exhibited prudence to negotiate the time distortion maze, charity to escape the force field trap, kindness to help the crying child, wisdom to solve the riddles, and faith to pass through the wall of fire. Osric quotes, "Truth is elusive to those who refuse to see with both eyes," paraphrasing the Book of Origin, "Truth eludes he who does not seek it with both eyes wide." Name magic is common in most mythologies. To know something's secret name is to steal its power. When facing the dragon, the Guardian's name is "Ganos Lal," Morgan Le Fay's Ancient name. Merlin has lived many lifetimes, first in Atlantis, then on Earth before the dawn of our civilization, then he joined the ranks of the ascended, and finally returned to mortal form to live out his remaining days among the noblemen of Arthur's court before being preserved in stasis. According to myth, Morgan Le Fay trapped Merlin in a cave and left him frozen there for all eternity. In reality, Morgan protected the one man capable of building the Sangreal by keeping him in stasis. 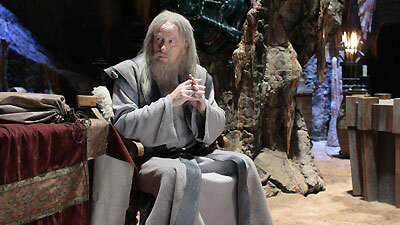 Merlin remained in stasis well over a thousand years. The plaque in Ancient reads, "Here lies Myrrdin, Archmage of the Round." To keep Merlin hidden, Morgan set up a system using the gate and an obelisk that would activate automatically every few hours to transport the chamber through a circuit of planets cut off from the rest of the gate system by a deliberate alteration of the DHD program: a world of desert, blizzard, and rain forest. The Ori gain their power from the lower planes, so much so that one day they shall be strong enough to wipe the Others out. In the face of such a threat, a strict policy of non-interference is absurd. A DHD buffer typically holds the last 50 addresses that were dialed.